According to a recent study done by Zoocasa.com, residents in Canada and the US face similar issues when buying housing — namely, incomes keeping pace with real estate prices in the hottest markets. “A Torontonian earning the median income of $49,495 ($65,829 CAD) faces a gap of $19,121 ($25,431 CAD), while households in the Florida city earning the median income of $33,999 fall $20,733 below what they'd need to earn to qualify for a mortgage on the median-priced home,” the report says. 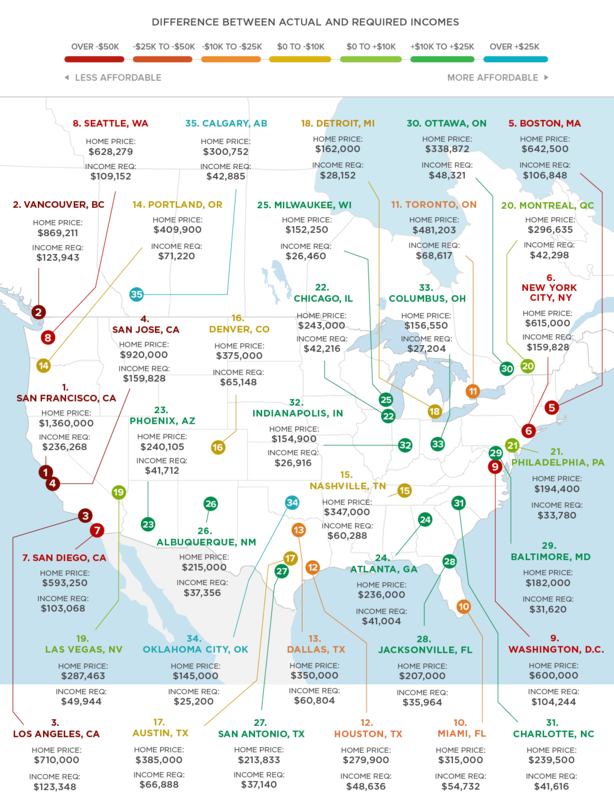 Vancouver, Canada's most expensive housing market (and #2 on the list overall) is compared to San Francisco, which is the least affordable city listed in the study.